The vice-chairwoman of the Labour left-wing grassroots group Momentum has been sacked from the role amid a row over comments she made about anti-Semitism. 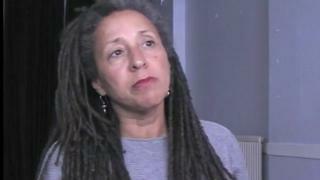 The organisation said it viewed Jackie Walker's behaviour as "irresponsible". It said remarks on Holocaust Memorial Day and Jewish school security at a party training event were "ill-judged and offensive" but overall she did not appear to be anti-Semitic. Ms Walker, who is Jewish herself, has said she is not an anti-Semite. She was suspended by the Labour Party in May over comments made on social media in which she claimed that "many Jews (my ancestors too) were the chief financiers of the sugar and slave trade" but was re-admitted following an investigation. She was suspended again from the party last week after a leaked video emerged. It showed her saying at an anti-Semitism training event: "I came here... with an open mind and I was seeking information and I still haven't heard a definition of anti-Semitism that I can work with". She also questioned why Holocaust Memorial Day was not more wide ranging. Speaking to Channel 4 News later, Ms Walker said she was not challenging the definition of anti-Semitism but rather "wanted to be clear what we were talking about". Asked if she would describe herself as an anti-Zionist and not an anti-Semite, she said: "Yes. I certainly wouldn't call myself an anti-Semite as I am Jewish and my partner is Jewish." In a statement, Momentum, which was set up following Jeremy Corbyn's 2015 election as Labour leader, said its steering committee had voted seven to three to remove Ms Walker as its vice-chairwoman. "Having read reports of what Jackie Walker is alleged to have said, listened to the leaked video, and heard Jackie's version of events, the committee does not regard any of the comments she appears to have made, taken individually, to be anti-Semitic." It said Ms Walker "should have done more to explain herself to mitigate the upset caused and should have been careful about statements on this and related subjects, whatever her record as an anti-racist, which the committee applauds". Momentum added that on the basis of the evidence it has seen, she should not be expelled from the Labour Party.